The must have stand out piece by Armani Junior for boys this Fall Winter, I love this sporty navy blue and grey reversible jacket in a cool varsity style, with a zip to fasten. It’s actually two jackets in one with a silky smooth navy blue body and grey jersey sleeves with a logo and two zip pockets on one side. On the reverse side, you’ll find a jersey body and silky sleeves with a cool worn effect ‘AJ’ logo. Best part, a tiger printed on the back and a signature eagle logo on the chest! Complete the look with an Armani Junior Boys Grey T-Shirt with British Bull Dog made from soft cotton jersey with a quirky image of a British Bull Dog on the front featuring the designer’s ‘AJ’ and signature eagle logo. Bull Dog t-shirt also comes in a shade of light blue. Looks perfect with a pair of comfy Armani Junior washed out jeans. 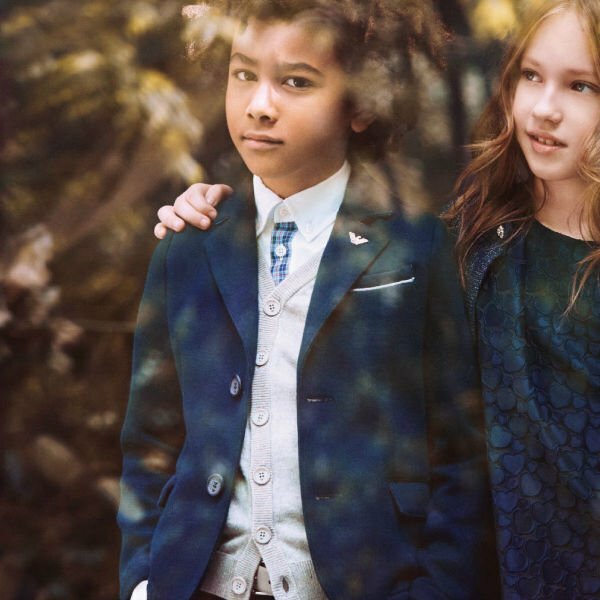 Shop Armani Junior Boys Fall Winter collection online at Childrensalon designer children’s store located in the UK and ships worldwide at low prices.